To kick off your fall break your mom and dad are treating you and 5 of your friends to a day at Worlds of Fun. Your mom is really busy helping out at the Northwest Fun day and has asked you to figure out how much it will cost for the tickets for everyone to go. As a special treat your mom said you can figure the Day pass plus the Fright Lane price. She reminds you that you will need a ticket for both of your parents, your little brother, older brother, and your baby sister. 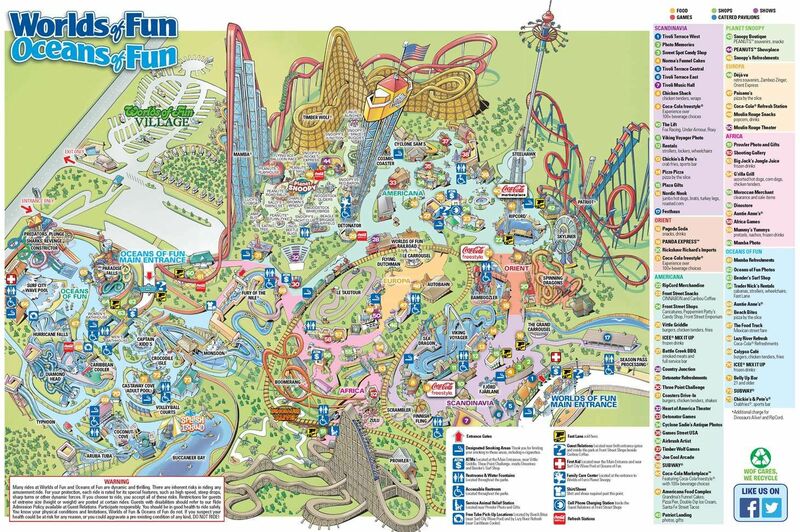 Your friends and you are so excited that you map out your day at Worlds of Fun. As soon as you pass through the gates you head left to the Scrambler. After you finish riding the Scrambler you then head to the Spinning Dragons. Tommy then wants to ride the Bambozler. Amy can't wait to ride on the Skyliner. You all agree that the Cosmic Coaster should be next on your list followed by the River of the Nile. As you look at the Worlds of Fun map you realize the ride you had been dreaming to ride is no longer there. You were looking forward being flipped and taken up 60 feet. Instead you promised to go on a boat ride with your baby sister. Your parents had you set a reminder in your phone. You and your friends are to meet up with the rest of your family at 8:00 pm near your mom's favorite ride. Your mom and dad love to race the horses before they leave the park.